Be Recognized as an Investment Recovery Professional! Get a Career Boost! Begun in 1994, CMIR certification has proven to further your standing in the IR profession. 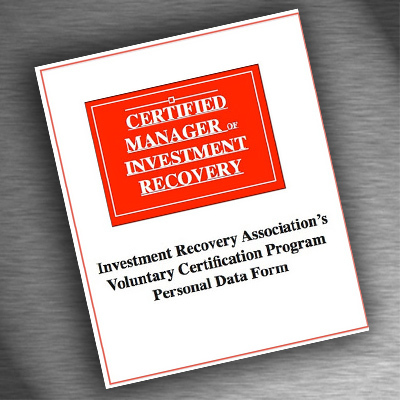 The CMIR program was designed not only to elevate professional standards and personal performance but also to recognize and distinguish those who have reached the highest level of professional achievement in investment recovery management. In more than two decades, only about 200 investment recovery professionals have earned the CMIR designation, so this is an elite group! Individuals obtaining the designation have been tested to meet high standards of current knowledge, expertise, and professionalism and have pledged to adhere to a strict Code of Ethics. Experience in the investment recovery profession for three or more years. Acceptable in character, ability and reputation. Pledged in writing to adhere to the Investment Recovery Association Code of Ethics. Developed 35 points from your Personal Data Form. Pass written exams proving a working knowledge of the profession. Take the first step towards attaining your CMIR certification. Your career will thank you. The CMIR Fellow is awarded to an individual who has been an active member of the Investment Recovery Association and has had life experience in the investment recovery profession for a minimum of 20 years. The CMIR Fellow must also contribute substantially to the professional development of others in the Association. Since 2003, when the Board of Directors approved this distinction, there have been just six individuals who have achieved this high merit; Bill Yerkey (2004), Dennis Knutz (2004), Paul Wengert (2006), Michael Rhodes (2012), Todd Thompson (2015), and Ron Brooks (2015) . There is an extensive list of criteria for consideration and a separate nominating form for those who wish to have their submission reviewed by the Investment Recovery Association Board. If you are interested in the nominating and selection process for a CMIR Fellowship designation, please contact the Association Office.